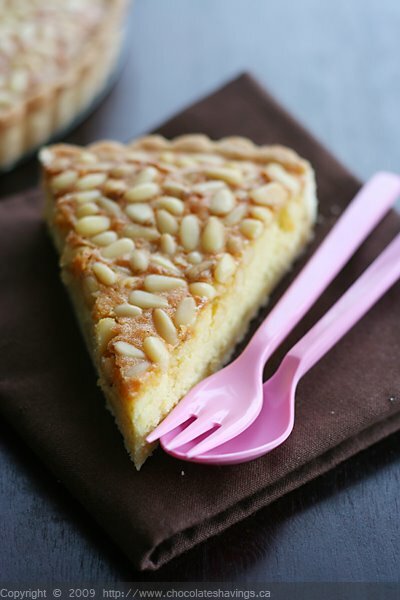 Since giving Oliver Nick Malgieri's book for Christmas, he had been eying this Almond and Pine Tart over and over again. I could see him flip back to the page every time he browsed through the book. A couple days ago, we got our baking gear together.. and here it is! We have somewhat of a love affair with pine nuts in this household so he knew this would quickly become a favorite. We had a tiny bit of mishap with the recipe though. It calls for 'almond paste' - but we got marzipan instead. Marzipan is basically almond paste with added sugar, so we used the marzipan and omitted the call for sugar in the recipe. I was suggest getting canned almond paste if you can though because I think it would make the consistency of the filling slightly more airy. I also think I will add a handful of crushed pine nuts to the batter next time, with a couple tablespoons of orange juice. The tart was delicious nonetheless - and a nice change from the classic desserts we are used to seeing in pastry shops! Set a rack to the lowest level of your oven and preheat to 350 F.
Combine the almond paste and sugar in the bowl of an electric mixer. Beat on medium speed until the mixture is reduced to fine crumbs, about 2 minutes. Add one of the eggs and continue beating until the mixture turns into a heavy paste. Beat in the butter until it is completely incorporated. Beat in the second egg, then the egg yolks until smooth. Beat in the vanilla and lemon zest, followed by the flour until fully incorporated. Use a large rubber spatula to give a final mixing to the filling and scrape it into the prepared pastry crust. Scatter the pine nuts all over the almond filling, gently pressing them with the palm of your hand to make them adhere. Bake the tart until the crust is baked through and the filling is set and well colored, 30 to 35 minutes. Cool the tart on a rack. Such a divine mixture of nuts!! And that book is definitely great. That is an absolutely gorgeous tart. I would love to try that sometime. This is beautiful. The almond paste that's available in my area comes in a roll. I'm concerned about its texture. Dare I chance using it? I've never seen almond paste in a can. that looks so simple but so good. beautiful shot. I absolutely love pine nuts, also. Beautiful job on the tart - it looks great. This looks lovely! Quick question: This is for an 8-inch tart pan (the size you referenced in your tart dough recipe)? Gorgeous looking tart! I have a whole bag of pine nuts in my freezer waiting to be used! I love pine nuts, too! I can't wait to try this tart. It looks absolutely beautiful--not to mention, delicious! I need to get my hands on Nick's book, for sure. I have always wanted to try baking with pine nuts. I have only used them in savory dishes. This tart looks like a nice place to start! Beautiful. ohhh looks delicious! I don't think I have ever come across almond paste... or maybe I have and thought it was marzipan. That tart looks good! I had not thought about using pine nuts in a sweet dish. I will have to try it. Beautiful tart and great prop for your photo. I find very interesting that you use pine nuts for a sweet treat. I'm going to do the same. What a neat idea. AND It looks gorgeous. This tart is right up my alley. I was actually just flipping through The Modern Baker in a bookstore earlier today - it's definitely on my want list.